I, like most people I think, always had mixed feelings about Joan Rivers. Of course I was an avid watcher of Fashion Police, not because of Joan, but because it was the only show of its kind. One devoted solely to celebrity style and high end fashion labels. My knowledge of Joan is limited to her role in that, however, I must say, the woman did speak some truth. Unfiltered, politically incorrect, harsh and sometimes down-right mean truth. Most comedians bank on this attribute, because after all, that is what comedy is right? Speaking the truth in ways that are almost too real, or make us nervous enough to want to release with laughter? Joan touched on what most successful comedians do. She said what others thought but for so many reasons (most often manners/common sense) wouldn't say. Fashion is an art, but one so easily criticized because of its' dual role as an expression but also a basic utility. We need to wear clothing and yes we like to be in style, but sometimes that is the real challenge in itself. Part of me says, "Fashion policing makes it less fun, less enjoyable" and "women's looks should never be the bud of a joke." But I have to admit, she has on many occasions tapped into my exact thought, or perhaps critique of celebrity fashion sense. Sometimes you have to find humor with the over the top, self-indulged celebrities we get bombarded with and think "she did kind of look like a whale..."
Joan took no safety in craft, and let's be honest, at her level of success and following, she really didn't have to. I am not sure which show she was fired from for being too, well herself. But the fact that she stuck to her true self, the good, the bad, the unsellable, is quite admirable. Joan Rivers embraced the extremes of her profession and life, on her face and out of her mouth. She really went all out, gave it everything she had, stood up for her beliefs and standards, and well she made it. This is Hollywood. And Joan Rivers, she made it. Move over e-card! 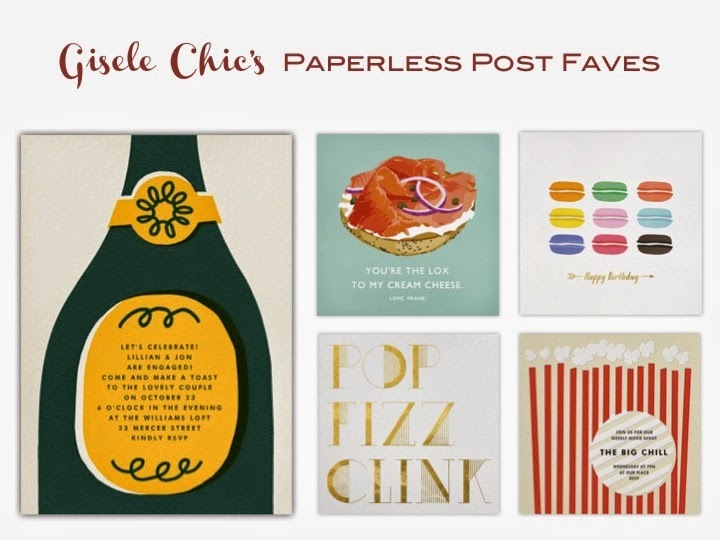 I'm sure many of you reading this post have either sent or received chic emails from this wonderful online stationary company, Paperless Post. Each time I visit the site I spend hours browsing through all the new designs, especially considering all of the designer collaberations paperless post has presented over the years! Narrowing it down to my top four for this post was quite the task, however, so is picking a single invitation for an event! And trust me, I have made plenty of paperless post invites for all kinds of things, some as typical as a birthday brunch or graduation party, but others have been a little less conventional, for example an invite for getting manis or to stay in with pizza and champs, for less then four people... BUT, can you blame me?!!! 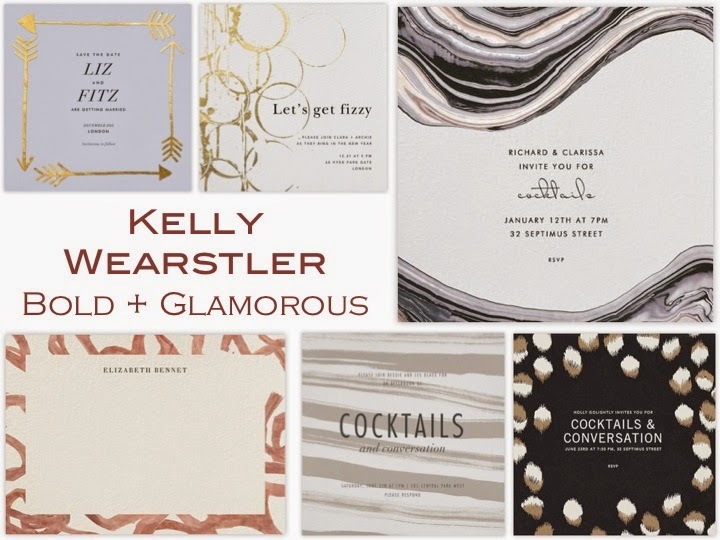 Kelly Wearstler has been one of my favorite interior decorators since I first became obsessed with design. She has such statement making patterns coupled with lots of gold and metallic accents in her decorating business and now design work too. So it's not at all surprising that her cards are at the top of my list, she just makes the best prints, many of which have been seen on walls or floors of homes she's done. Loving how well it translates to paper or paperless paper. Truly good patterns remain rich in whatever form! 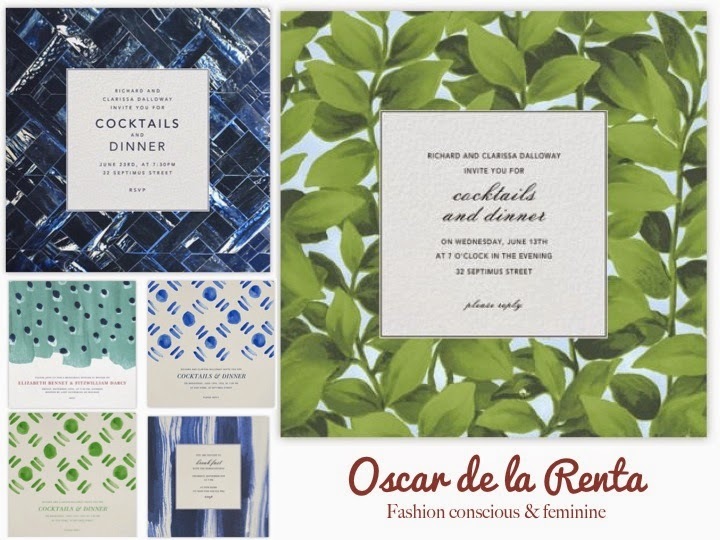 Of course Oscar turns it out with such pretty and fashionable pieces. The one thing everyone loves about Oscar's dresses is the slightly timeless feel found in each and every dress, even the trendy ones. But this surely translates onto his stationary collection, I feel like each generation can appreciate his designs and still feel fashion forward. 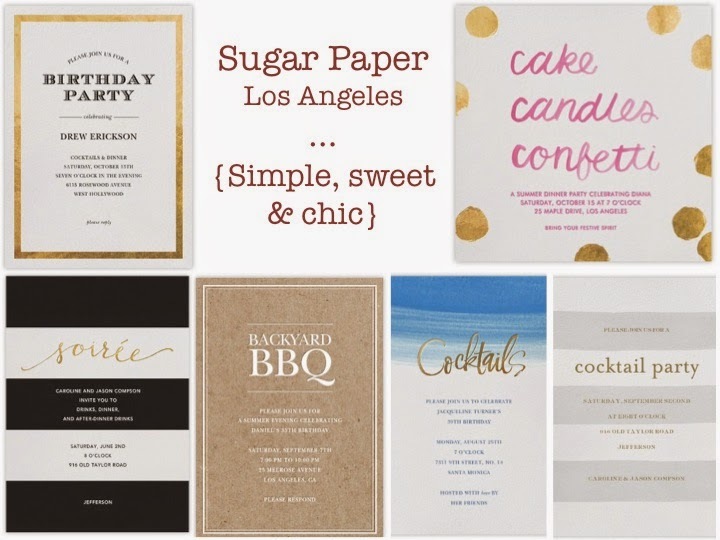 Sugar Paper is a no-brainer for me. As a small stationary company I am already obsessed with, it was just a matter of time. As much as I love the online designs, these are definitely worth purchasing in tangible paper form. I recommend ordering them with Paperless Post or visiting their adorable shop at the Brentwood Country Mart in Los Angeles. 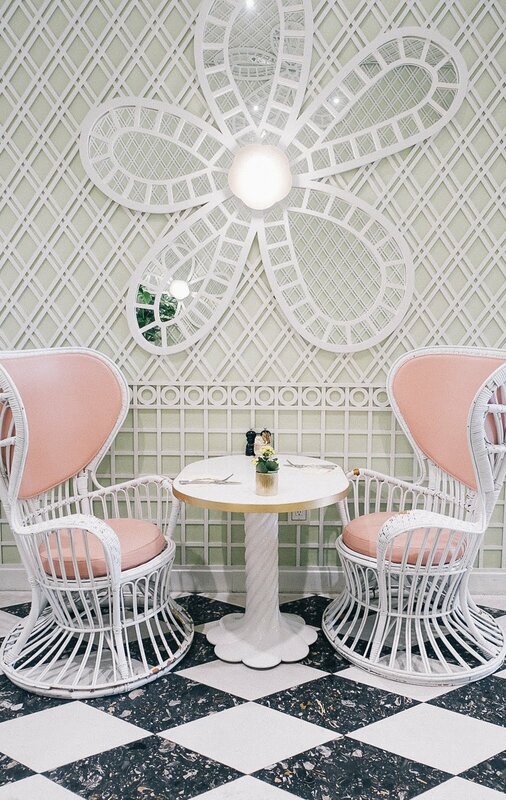 If my budget allowed it, I would decorate my entire apartment with Jonathan Adler furniture! His esthetic is color savvy and bold, just like I like it! 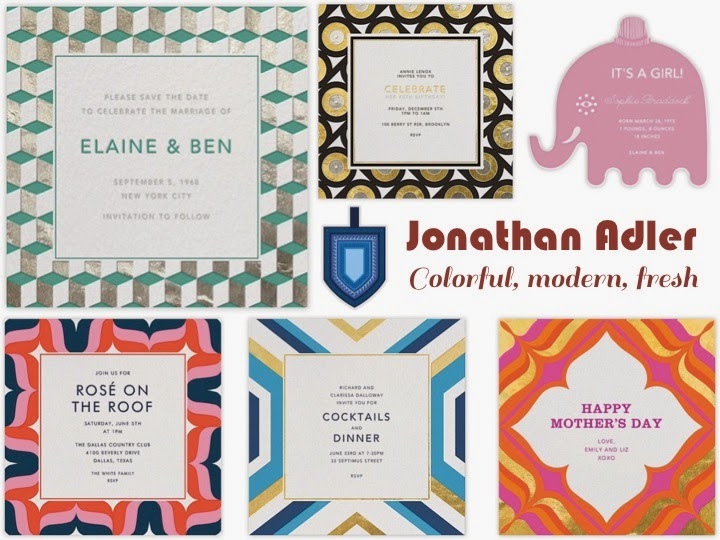 His stationary is full of pretty, preppy and bright colors, but all with hints of gold or silver, just to glam it up a bit. I'd use them all year round, just let to get my guests excited. They are quite energizing to look at! All of the stationary pictured above are ones I just couldn't leave out, from various designer collaborations and also from Paperless Post's own signature collection, which I must say is quite extensive itself. I particularly love the summery feel to all of these. I realize it's Labor Day, but I can't let go of summer just yet... I do live in LA after all! 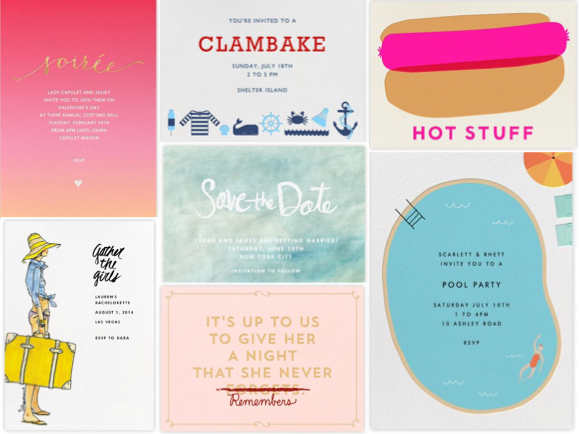 No more excuses for a boring emails, let's call it chic-mail.